'Thanks for your e-mail Pete. I am certain this is the same Alfred Croft. His daughter lives here in Oklahoma City and is a friend of mine. The family left Oakland for the Philipines in 1924. They were living in Manila when the Japanese overran the island at the start of World War II and the entire family spent the war in prisoner of war camps. He flew, I believe, the China Clipper for Pan Am. I agree with you on the rank and can't explain why the headstone says private. I haven't been able to find any additional information from the Ancestry.com databases to explain what the story is. Are you doing independent research on him? If so will you give me your contact information, I will pass it on to his daughter so she can contact you if you wish. The first flyers in the Philippines were actually Americans led by Frank Lahm, Jr. the first flying student of the Wrights and first in the US. He was tasked by the US Army to set up a flying school in Corregidor using Burgess-Wright aircraft and taught some American soldiers how to fly. The first batch of 25 Filipino flyers were trained by Joseph Stevenot and Alfred Croft in 1920 under the Curtiss Flying School to become the pilots of the country's first private airline, Philippine Airways Service, Inc. and the first government airline, the Philippine Air Service. Some of those 25 had very colorful exploits like flying from Manila to Madrid in the 1930s, a first for any Asian pilots. It's a long story, but it will be in my forthcoming History of Philippine Aviation. (8-6-10), you will find about links! Among the most helpful are the following. 1920 - 1921 This superb article on the Philippine Philatelist website offers a very comprehensive and detailed history of The Phillipine Air Service and is richly illustrated with unique and precious photographs. If time permits, I think you will want to read the entire article, which you can access by clicking on the title above. "He enrolled in November 1919 at the Philippine School of Aviation of the Curtiss Aeroplane and Motor Corporation at Camp Claudio, Rizal, as a civilian, not a military, trainee. Among his classmates were Capt. Zablan and Lt. Fernando after whom two airfields have been named, together with Lts. Juan Calvo and Leoncio Malinao. They received intensive ground instruction before they were allowed to fly solo. After riding in a Curtiss Seagull with his instructor, Alfred Croft, on November 9, 1919, he was allowed to make his first solo flight exactly two months later, making him the first Filipino pilot to accomplish the feat. 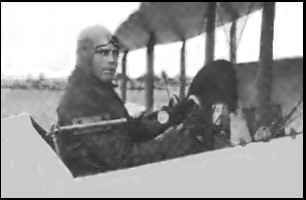 He made his first solo flight in January 1920 in a Curtiss Seagull in two rounds above Manila Bay and thus qualified as the first licensed civilian pilot in the Philippines.". You can read the entire, fascinating story of this pioneer by clicking on the title above. CEBU'S FIRST AIRMAIL You will find a brief but interesting story which involves "Renowned American aviators Maj. Joseph E.H. Stevenot and Alfred J. Croft." FIND A GRAVE John's entry on the Find A Grave website offers a brief, but important, biography and a very nice photograph of his headstone.